Ever start a new job and think, really? How did I not know it was going to be this busy right away? In a way, it’s great to wrap oneself up completely in a task, a meeting, conversations and thought. In another way, the art and practicality of breathing becomes laborious. Enter a Cotes-Du-Rhone, primarily a Syrah/Grenache blend. Two or three years ago, I would have thought something ‘unbranded’, or ‘not of a California’ title would have been weak or off in taste. Now, I’ve come to appreciate a region probably often under-appreciated, except for it’s glittery older sister, the Chateauneuf-du-Pape. Now I know better, as all older women do, that a table wine can be the star of one’s night and help catch up with the day…and breathing. 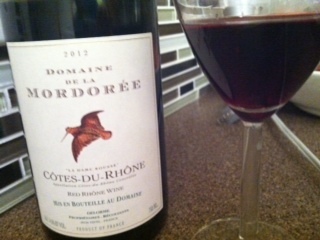 The wine: The Cotes-Du-Rhone, “La Dame Rousse” by Domaine De La Mordoree seemed like it would be lackluster in the store. It was in a bin, it was on sale for $16.99, had a red game bird on its label and displayed the ever popular vintage, 2012. Le sigh. Opening the bottle up, getting a whiff of the faint fruit, vanilla and cedar notes, I thought–okay. This is fine for tonight. On the palette, the red cherries and deep black current came out, as did the spice. Perhaps it was due to the 14.5% alcohol content, but the flavors seemed as if someone started to draw a blueprint, but then erased it and you can still see the outline and most of the details. The wine was medium on tannins and on length. I would have given it a nice 5/10 or on my scale, a 2.5. Then I read the description of the wine on the winemaker’s website, and noted it said to pair it with deli meats and cheeses (I had not eaten dinner yet), so I quickly added a smoked gouda to the line-up, and the distant taste and punctuated alcohol all of a sudden become a silky fruit roll up around the tongue, forming a nice lilt around the mouth–like it wanted to frolick in some flowers or chocolate syrup, but instead, did a small pirouette in silent joy. Understated, I think, defines a nice CdR. It was a good, pairing wine (something that perhaps should not stand alone). I would definitely have a few glasses, but my alarm is going off bright and early to work out, so will not miss the workout for this one. It was a great chance, though, to catch my breath.